You can follow my adventures in Australia's Coral Sea as I blog live for Discovery Channel on shark research being filmed for Discovery's 2008 Shark Week program Expedition Shark, along with underwater photographer Cat Gennaro. The researchers lasso the sharks (“shark rodeo”) and haul them onto the boat to retrieve radio tracking devices. Cool stuff! Blogging at the above URL should begin around Apr 5/6 through the 15th/16th - assuming the satellite phones work! You’ll be able to comment and ask questions which I hope to be able to answer along with the scientists and documentary crew! I leave tomorrow morn – will arrive Down Under Apr 1. I’ll also be doing a few audio dispatches on Discovery’s Earth Live program but that should be linked from the main blog site. I spent 2.5 freakin hrs on the phone with tech support for the satellite phone people (which I'll be using to send my live dispatches from Australia) and the tech support guy actually said to me, “I don’t know computers that well.” !!!!!! I had my "sharky party" last night - basically a bunch of friends hanging out at TGI Fridays restuarant drinking mojitos and eating appetizers and talking and laughing our asses off! I love my friends!!! (here's a pic from my cellie, but I think I look like I have my eyes closed or something so I resemble the creature from the black lagoon or something without eyeballs!) Several more peeps were there but we had a sort of rotating group! 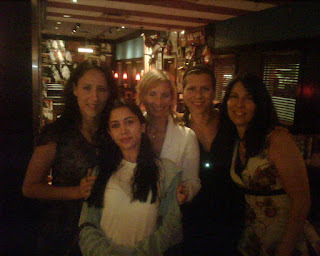 My friend Elise, in front, was my biology student way back when, and she is so cool. She is trying to buy the Astrodome! LOL. Seriously she is trying to turn it into The Astrodome Production Studio -a film studio - and make it "green" in the process. She's from Louisiana where they've made loads of moula bring in Hollywood studios to the back woods. I think it's a great idea and she is such a go-getter! She has the Houston Film Commission behind her and is making great strides. This is an alternative to turning it into a hotel, which is the other option on the County Commissioners' plates. The Houston Chronicle blogged about the film studio project idea a couple weeks ago, Lights Camera Action: Dome Needs a Makeover. Quinn Fox, Associate for Theology with the Presbyterian Church of the USA (PCUSA) and I at Garden of the Gods. I look like a dorkwad, but oh well. ;) The Epperson family who I visited when I was on my recent trip. They're awesome! Here are a few photos from our trip. 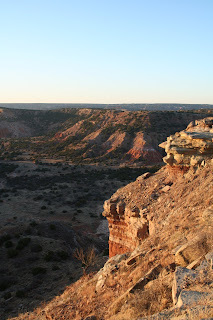 We first flew into Denver (after getting rerouted from our original destination of CO Springs) and then drove to Amarillo or more technically Canyon TX which is about 6 hours away, where we visited Palo Duro Canyon St Park. 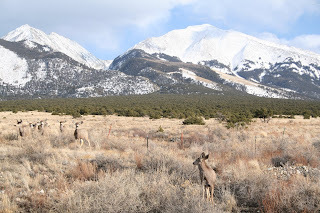 Then we drove back to CO Springs, visited some friends, and then went skiing for one day at Monarch Mountain near the artsy and historic town of Salida. 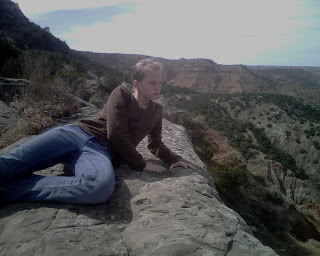 Palo Duro Canyon State Park, TX. We spent a few days trapping mesocarnvores (foxes, ringtails and raccoons) with grad student Naima Montacer and her professor Ray Matlack. 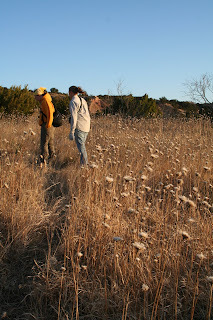 Traipsing through fields of dried basketflower in Palo Duro Canyon State Park, TX. Savie holding the raccoon we caught in the trap. We didn't catch any ringtails though - darn!! 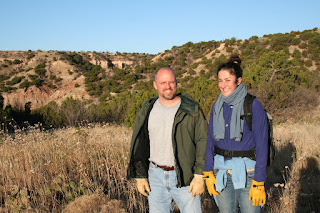 Dr Ray Matlack, West Texas A&M University Professor and grad student Naima Montacer - out in the field trapping in Palo Duro Canyon State Park. 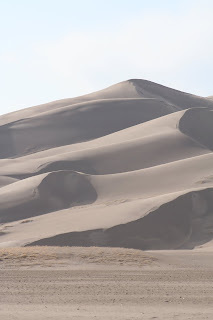 Great Sand Dunes National Park, CO. 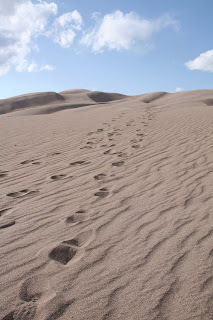 This shot reminds me of that poem about how God is carrying us when we feel that we're walking alone but there are always two sets of footprints in the sand -- taken at Great Sand Dunes National Park, CO. 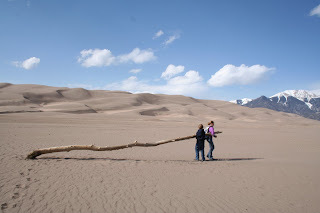 The kids carrying a gigantic stick (uh, tree?) through the sand at Great Sand Dunes National Park, CO.
Mule deer just outside of Great Sand Dunes National Park, CO.
Another shot of the mule deer near Great Sand Dunes National Park. 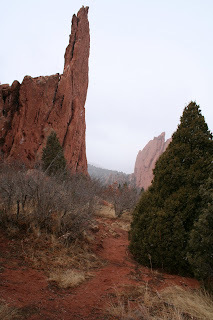 It was snowing all day when we visited Garden of the Gods in Manitou Springs, CO. It was awesome! 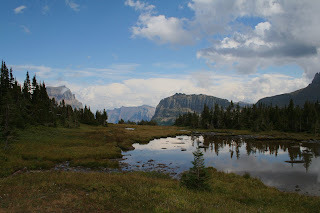 Unfortunately that meant the sky was whited out, and you can't see the peaks in the distance, but it was really neat. 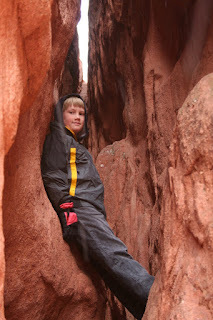 Snow on an evergreen in Garden of the Gods in Manitou Springs, CO.
Sam in a crevice at Garden of the Gods in Manitou Springs, CO. The kids skiing at Monarch Mountain near Salida, CO.
Now as for me - all in a day's work: I unplugged a huge pile of cat hair and Christmas tree needles from my vacuum cleaner, filed for an extension on my income taxes, met with the Head of my kids' private school about next year, went out to dinner with my kids (why buy food if I'm leaving again in 2 days?! ), did some miscellaneous work and phone chats with people, applied for a gig as a wildlife show host (that is my dream!! ), started to pack, uploaded these pics, and now it's 2am and I still have oodles to do... but alas I must get some rest. Ciao for now! Trekking Through Nepal's Grand Ridges, Travel Channel Online. This piece covers 3 trips in Nepal - In Search of the Red Panda, Everest Base Camp, and a no-trekking cultural trip to the Annapurnas. Three of the photos in the piece also are by me (the first two and the last one). Boom Time, Points of Interest Dept. Smithsonian Magazine. April 2008. "As the sun rises over the tallgrass prairie, one of the last wild Attwater's prairie chickens performs an unusual mating dance, called booming because of the low "woo woo" sounds the male emits." Skiing at Monarch Mountain was awesome yesterday. The kids had lessons all day and I had a half day one. Savie was a bit frustrated I think. She fell a few times but she did great. She was tired at the end of the day. Sam just loved it. They only got as far as the bunny slope but I got to take a couple runs down the whole green slope. It was only my 2nd time skiing but I feel like I'm pretty good with balance - not quite good enough to go really flying but I get to going pretty fast! Then Sam and I went climbing around in this snowy area, and tried to have a snowball fight but the snow was either chunks of ice or too powdery. But Sam managed to nail me in the arm with a huge ice-ball that STILL hurts!! We couldn't make a snowman because of the snow. But we did slide down a bank a few times and that was fun. Savie stayed in the car because she was tired. Then we went to eat dinner at this awesome pizza place in the town of Salida where we're staying- Amicas. We waited for like 45 minutes and the tired kids weren't pleased about thaht but I appeased them with a drink - hot apple cider for Sam and a homemade root beer for Savie. And I got a Winter's Ginger microbrew which was quite good. Well it's time to get ready to go to the airport! "Sam It!" - Me trying to say "Stop It Sam!" But he thought I was combining his name with a swear word - ha ha! "You'll get sand in your crack!" - Sam to me when I was about to slide down the sand dune on my bottom instead of running down. This morning, we got up early and went out to check live traps with West Texas A&M University grad student Naima Montacer and Professor Ray Matlack in Palo Duro Canyon State Park. We checked traps in 4 different habitat types - riparian (by the "Prairie Dog Town Fork" of the Red River), escarpment (rock face), mixed-brush-woodland, and mesquite savannah. Escarpment is the only habitat they've ever caught ringtails, but she's studying "mesocarnivores" in general which also includes things like foxes and raccoons. Naima baits the traps with sardines and apples and honey. 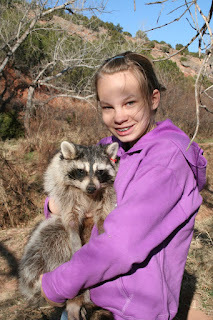 Unfortunately we didn't catch any ringtails...but we did catch a raccoon which Savannah got to hold (it was anesthetized). Hopefully we will catch one or more tomorrow because they're pulling the traps and that is our last chance!! After lunch at a Thai place with everyone, the kids and I went first to look at a prairie dog town on the side of the highway then back to the park to explore. I have fond memories of going to this huge prairie dog town outside of Lubbock when I was about my kids' age. My cousin, aunt & uncle lived in Lubbock while my cousin and I were growing up (we're the same age), and we used to go there for holidays. The kids had fun watching the prairie dogs running around, ducking their heads in their burrows, and wiggling their little tails about. There were lots of tumbleweeds rolling across the plain on this very windy windy day. So we went to our gate about 30 minutes early, only to find it had been moved to another gate - across the airport. We went to the new gate just in time to find out the flight had been cancelled. So we got in line (get used to this waiting in line thing- we waited in lines for hours upon hours!) ALL flights to CO Springs were cancelled for the whole day on Continental. The ticket agent checked other airlines and other Continental flights to Amarillo and Denver, and she somehow miraculously got all 3 of us on a 220pm flight to Denver. This is about 1.5 hr north of CO Springs, so then the only problem was figuring out how to get our rental car, which was reserved in CO Springs at a special rate. So we made it on the flight, and we even all sat next to each other (much to Savie's chagrin- she wanted to sit by herself - or at least not by me...). But we made it safe and sound with a mildly bumpy flight to Denver. Unfortunately our luggage had other plans. We waited at the airport for about an hour but no luggage. We got in another line... then we told the lost luggage lady where to deliver it. She had no clue where it was - Houston? Denver? CO Springs? Next we went to get our rental car - and waited some more. There were around 25 people in that darn line, then even once we got to the counter, it took a good 'nother hour. First they were going to were trying to honor the rate I had reserved the SUV at CO Springs at, then the manager said no they couldn't. Then we got back to where they could. Aye yi yi. So at about 8pm or 9pm, we finally drove away from the airport - 12 hours later... We stayed with friends in CO Springs and hoped the luggage would be delivered overnight. No such luck. Plan A was to drive straight from CO Springs to Amarillo Tuesday afternoon, but since we wanted to wait for our luggage we waited... in vain. Since the ringtails can't wait (I'm writing an article on ringtails) this morn, without luggage, we went shopping for a few items - with $150 from Continental - then headed to Amarillo. Or Canyon technically, home of West Texas A&M University. Despite it being a very long two days full of one thing after another going wrong I actually wasn't in a bad mood at all and considered it a good day! The kids kept saying everything is going wrong and we had such bad luck and asking whose "fault" was it (Savie blamed Sam's new shoes!). It is true that one thing after another went wrong! But I said the most important thing is we got here safely. Then on top of that, we were even able to get on a new flight at all, we were able to get the nice rental car at the same rate, we got to stay with a nice family and even got to see snow! Plus we got some $$ to buy some new things. We have a little wiggle room built into our schedule, so it's all good. So just when all the "bad" should be over, this afternoon we arrived in Amarillo after a 6.5 hr drive and we were going to go see these bats emerge from a tunnel/cave with the same biologists who are doing the ringtail study. I didn't realize how far it was out of town or I wouldn't have gone... It was an extra 100 miles each way. And this is our luck: We arrived literally 5 minutes after the bats emerged. 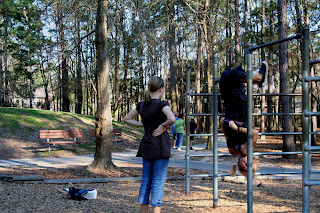 And surprisingly the kids were totally good sports about it but I am exhuasted. And sick of driving! So let's hope tomorrow is a brand new day, with a little bit better luck. I leave in the morn with the kids on a mini-adventure before Australia. 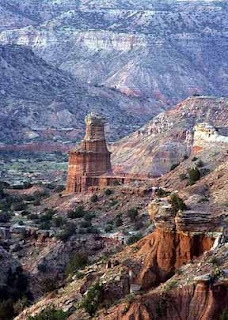 As mentioned a few days ago we're flying to Colorado Springs, then will be renting a car and driving to Palo Duro Canyon State Park outside of Amarillo, TX. Yes I'm flying from Texas to Colorado then driving back to Texas. Go figure! We'll trap ringtails with a graduate student, hike some trails, look for prairie dog towns and maybe a roving buffalo herd... and then will drive back to Colorado Springs for Easter weekend. Then we'll hightail it to Monarch Mountain and the artsy town of Salida on the Arkansas River. 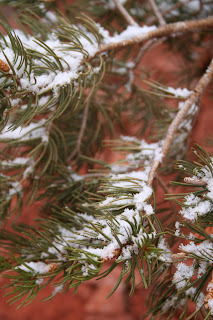 The weather's looking like it just MIGHT snow next Saturday - wow the kids would be soooo thrilled!! 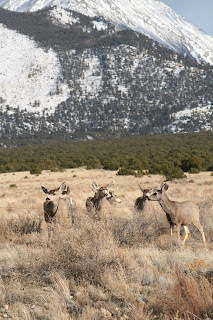 Oh we will take ski lessons at Monarch Mountain. Well the kids will. Do I need them? Not sure?! 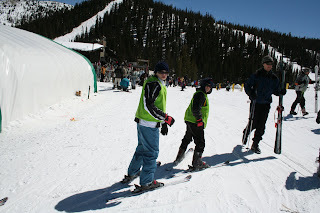 I went skiing once before in my life, at Breckenridge a couple years ago and loved it! That was actually at the very beginning of this blog, at the tail end of a devastating relationship that I could not have been more wrong about. Well you live and you learn...That was the last time I saw Shane. But I treasure more that my best friend Daline drove out from where she was in CO to visit me and we hung out and had a great time! As the old saying go, men may come and go but girlfriends are the true soul mates. I took the kids to see the Horton Dr. Seuss movie today and I loved it! Horton discovers that there's a whole Whoville world on this tiny speck on a clover flower but no one believes him. So the kids he teaches start pretending they have worlds on a clover also. So my favorite line was this little "kid" who said, "on my speck, the people are all ponies who eat rainbows and poop butterflies!" 2. I really wish there wasn't hate in the world. 3. I would maybe, possibly consider climbing Mt. Everest one day I've decided. Only under the right conditions (someone else paying - or I'm a zillionaire). Maybe I'll start by learning some climbing techniques. One day. 4. I have wanted to go see mountain gorillas in Rwanda since I was a teenager. That is my ultimate dream trip. One of Discovery Channel's recent blogs was following Lucy Spelman's mountain gorilla adventures. I'm sooooo jealous. I love mountan gorillas because they are super furry whereas I think lowland gorillas are kinda fugly. 5. When I was about 5, I decided I'd make money by holding a roving garage sale. So I took my little red wagon and some old toys and things I made and went door to door selling stuff. I convinced my cousin Holly to go with me. At Christmas I'd go pick mistletoe and sell it. 6. I used to rearrange the flowers on graves in the cemetery next to my house in Eugene. I spent a lot of time in the graveyard. 7. When I was in high school, on occasion, I would catch a super-big Texas roach, put it in a ziploc baggie, and freak out the girlie girls at parties. 8. I used to be scared to catch or even hold the crawdads my dad and brother caught, and I always wish I'd overcome this fear when I was a kid. I feel kinda wimpy about that now. 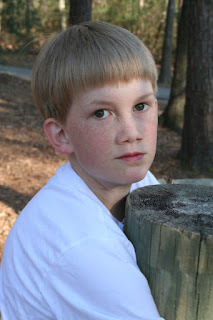 9.I used to think I looked like a hamburger. 10. Have you ever felt like you were driving through a pop-up book? I have. Today was an awesome day. The sun was shining, it was clear and beautiful.... so after getting some work done earlier, at 3pm I sat in the backyard reading the script for the Expedition Shark documentary I'm going to be writing about in Australia, and editing an article I'm writing on biomimicry. I soooo love sunshine!! I also imbibed substantial quantities of carob chips. I mean I was like licking the melting carob off my fingers! I. LOVE. CAROB!!! Sometimes I think I even like it better than chocolate. Then I headed out to look for some new sunglasses. I lost my prescription ones in Nepal and since I now have contacts, I looked for a nice pair of regular old sunnies, but not cheapos like I used to buy. I ended up at the mall, and got a cool pair of Ralph Lauren ones. Then I remembered I had a $50 Gap gift card from my dad from Christmas.... So I bought some new duds which was great fun since I rarely get new clothes unless I have a particularly compelling reason. And there were great sales! I then ended up in a few other shops... getting some loungy comfy things to wear over my bathing suit on the ship. On the way home, I had an insatiable craving for cilantro, so I picked that up at the grocery store, and came home and heated up some of my home made veggie-quinoa soup and topped it with fresh cilantro and chopped tomatoes. Super yummo!!! Well this is not so profound, but it's what is on my mind, and now I'm going to bed so I can wake up in time for church and my Financial Peace University class. Oh, funny thing, I wore green Lucky capris and a sleeveless green striped top today and I had no idea it was St. Patrick's Day! Wow that 4-leaf clover picture brings back memories of searching for them at my dad's place.... and I did find several! Luck O the Irish to ya! I had checked out the Shark Week 20th Anniversary DVD set from the library and finally got time to watch a couple of the shows. I hesitated as to whether I should watch this, because I really do not feel scared at all about the prospect of swimming with or diving with sharks, so I wondered whether it might just be best to stay in a state of total oblivion as to what I'm getting myself into, rather than sitting around watching shark attack shows! But I decided to watch. At first I just watched a nice sweet documentary about various sharks - the gentle giant whale sharks, the smaller reef sharks, manta rays, and a bit about great white shark natural history. Ho hum. Then I decided, what the heck, I will next watch the Shark Attack show. Just kidding.... Actually, it didn't scare me at all either. I did learn some things that were quite interesting. For one thing, most shark atacks occur at the surface when people are swimming and thrashing about or surfing. Underwater, as I will be, you're at much less risk since you are not kicking and appearing to be a struggling prey item. One one of the shows, one shark diver regularly swims really close to tiger sharks - the second most aggressive shark - and believes it to be safe. What scares the bejesus out of me is staring at the ginormous stack of receipts from 2007 that I have to now organize and compile for my income taxes. I am only home for 6 more days before leaving for Australia (there's a trip to Colorado and Palo Duro Canyon in there first). How the heck am I going to get it done, with all the other things I need to do? In the writing classes I teach, my students often talk about feeling overwhelmed at the task of knowing where to begin. There are so many angles to tackle learning to publish in magazines. We analyze the magazines themselves. We come up with saleable ideas. We work on ou r writing, and we work on query letter writing. So with all these things, it can simply seem overwhelming to get started and to just sit down and do it. But that's what you gotta do. Just start. Anne Lamott writes in her book, Bird by Bird: Some Instructions on Writing and Life, (which is one of my favorite books and absolutely hysterical) about how her brother had this huge report due on birds that he's waited until the last minute to do. He was in near tears sitting at the kitchen table, overwhelmed. Their dad came up and said to him, "Bird by Bird, buddy. Just take it bird by bird." I like to call them microsteps . Often an overwhelming task can be broken down into something more manageable when you set microsteps, and accomplish them one by one. Bird by bird. When I went to the optometrist to get my contacts, she did some tests on my tear glands. Then she asked me, "Do you take Fish oil supplements?" I replied, Yep. She said, "I knew it!" She said my tear glands were very healthy and she noticed that whenever people took fish oil supplements (or flaxseed oil) or ate salmon twice a week they had really healthy tear ducts but when she would notice they would not tear up well or the glands produced a milky or cloudy substance (ewwww) then she'd ask and inevitably they would say no, they didn't take the supplements! So of course then she'd recommend them. But anyway it was kinda cool to see a direct result from taking a particular supplement in terms of my health! I was reading some of my old journals and in them I'd written about how I wanted to get rid of this anxiety and stress and I realized I've been dealing with this issue for years! I guess it's my "vice" other than my blackberry. 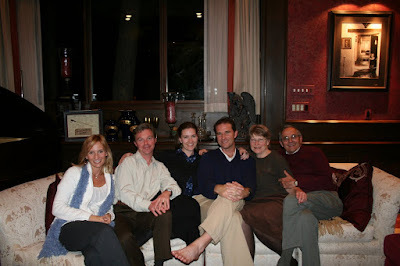 When I was in Nepal I told Tim - another traveler - I didn't have any vices. All the guys on the film crew smoked and drinked and cursed heavily, among other things, and I didn't even drink most of the whole trip. I do drink on occasion it certainly is not a vice. I gave up smoking when I was 20. Many moons ago. So here I was thinking I didn't have any vices then I got home and whammo! I realized that my crackberry is my addiction! My email, my computer. It can be bad. One day I gave myself an "email fast" and I think I'm going to do that again tomorrow. Maybe... Can't I just check it once? Pretty please? So besides the crackberry vice it's also that I have a sort of "too much to do" stress feeling all the time and I say "I'm stressed". I don't have like panic attacks or anything of any sort. I just feel a sort of random overwhelm feeling. And darned if you don't know what? I think it's related to the email!!! Because I never have stress when I travel - even if I do check email it's not constantly like when I'm at home. I got to thinking that it could even the answer - or one answer- to that question of the other day about how do I get that stressless, larger than feeling while at home as opposed to just when I'm traveling... Get rid of the stinkin email! Or at least the addiction. The thing with email is that it's like a Giant To Do List!!!! "I would take a vow not to worry so much but I would have to have a prefrontal lobotomy to keep the vow and that seems excessive." -- Ellen Gilchrist in The Writing Life. Bwa ha ha ha ha!!! That's about how it's been working for me, so far. I hit a goose today with my car. It was really ugly. It was walking straight across a 4-lane busy road. What was it thinking? It was a domestic goose that lives at a pond built next to a suburban neighborhood. In springtime they walk back and forth across the busy road with their ducklings. Being domestic geese, they do not fly much. This one was particularly ugly. It was mostly black with some white feathers, but had all these ooky red bumpy tubercles on its nose. Erm, I mean its bill. I totally slowed down to avoid hitting it, but I could not stop completely because I was about to be rear-ended. I really thought I'd avoided the darn goose when I heard a loud THWACK on the right side of my car. I had to keep driving so the car behind me didn't hit me, but I stole a quick glance over to the side, and there it was, standing on the side of the road, flapping its wings, like damn, that hurt. I felt bad. But apparently not bad enough to stop. My mom and I can usually not stay in the same location for more than 24 hours without driving eachother batshit crazy. We're complete opposites, and not in a ying and yang kind of way. I'd say it's maybe getting a little better lately but maybe we just have learned a somewhat safe emotional distance. 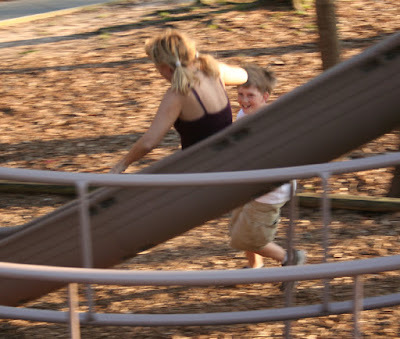 We bump up against one another and pull away more quickly without the huge knock-down dragouts of my childhood. Though we still get the claws out and raaaarrrr at one another a bit. So today as usual we got a little stress out at each other. I was worried we were going to be late for Savi's play and I was like Mom can you at least drive 5 miles over the speed limit?! You are driving like a grandma! She was like "I am NOT going to speed. We will get there just fine!" (and of course after she got home she emailed me a thing on speeding and someone killing a kid who sped... aye yi yi). As we approached downtown, driving mostly in silence, she told me I should apologize to her since we were, in fact, going to be on time. I actually was about to apologize as a matter of fact, and I said Mom you never apologize. You raised your voice too. I said why don't you apologize? She said, I do apologize, you have short memory. I said, Mom I'm not sure you have ever apologized about anything in your whole life! I don't think you know how to apologize! She said, sure I have. I said, OK apologize for something right now. She goes, "OK I'm sorry that you felt that I..." I interrupted. MOM! You can not apologize that I felt something! She said, well what do you want me to apologize for? And I said, I don't know. Anything! Can't you think of anything you did in raising me to apologize for? She said, no, I can't think of anything right now off the top of my head. I said well what about right now! You can apologize for raising your voice at me. After about five minutes of conversation perhaps, darned if she didn't actually do it!! I about fell out of the car. Maybe it was because I'd gotten mad when she wouldn't apologize I told her that really when you are unable to apologize you are placing yourself as the God in your life. She said that was totally inappropriate. But I said every situation has two people and even when one person thinks they are 100% right there is always some way to look at the contribution to the problem and apologize even if just for the sake of improving the relationship. Jesus died to forgive us, and tells us to forgive even if someone sins against us 7 times 77 in day and asks for forgiveness. We must forgive. And it's the central theme of receiving grace, that we also must humble ourselves enough to say we're sorry and need forgiveness. I said to her, mom, I do things wrong all the time and I just apologize and try to right them. Anyway, on another note I also was observing in myself that when I am around her, I have this wall up. We hug and say "I love you" but there's not a closeness. I might say there never has been, and that may be true, but it's more like I almost ignore her to some extent. Maybe because of fear of allowing myself to get so close that I get my buttons pushed which I generally refuse to do these days as I leave a situation before it gets that way. Maybe fear of being hurt more myself from the situation. But I got to thinking that I do not treat my friends like that. I treasure my friends, and go out of my way to show them I love them, and do nice things for them and send supportive loving emails and visit them and spend time with them. I once heard the saying that we love God only as much as the person we like least. And I think that although I certainly don't consider my mom the person "I like least" I probably treat her the worst. Well not's like I beat her with a stick or anything... come on people! But you know what I mean - I think. I don't show her enough that I treasure her, and that I love her, and that she is beautiful and wonderful the way I know Jesus thinks of her. So I will have to work on this. The question is, do I feel "bad enough to stop"? Or to "start" offering healing love and grace? On a totally unrelated note, I got (eye) contacts for the first time the other day, and I love them! However I'm still a bit squeemish about taking the darn things out. I have noticed that when I am sitting there on my bathroom counter trying to get it out, I am saying to myself, "For God's Sake Wendee you can pick up frogs and snakes and rats, get a hold of yourself and stick our finger in that cotton-pickin eyeball!! I have to go do that right now. Just a few pictures from last weekend at the park. 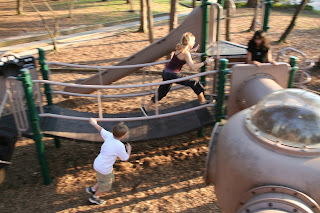 I love this park - it's awesome! We've been going there since they were little. I love this photo. Savannah took it. Love the smile on Sam's face! Here is (remember from my blog post a couple days ago) Savannah saying that I'm acting like a 2-year old. You can just see it in her posture! However I'll have you know at age 2, I could not yet hang upside down from the bars. That wasn't until age 5 or so :) And it's soooo fun to flip around off of it too! Yes I am proud to be a treehugger! This is going to be a short one but as I was driving home from REI this evening (I'd taken the kids to get a few snow/ski apparel items) I started thinking about when I took them to Australia in August 2006. It's hard to believe it was nearly 2 years ago, but it was such a precious trip in my memory. Sam keeps telling me it's "no fair" that I get to go again and he doesn't. That makes me feel good that he has fond memories of it too. It was awesome. It was incredible! We saw so many amazing things and hung out with my amazing friends who I hadn't seen in 20 years and it was like we'd just seen one another the year before. It was the first trip I'd taken with the kids alone as a single mom, and their first trip overseas. It is just a truly special memory for me. Australia is my favorite country in the whole world (I do adore America, so I mean country to visit). I can simply not wait to sit over there with my friends Jenny and Rin and sip coffee on the beach (outstanding coffee and not a Starbuck's to be found). I am excited to go on the shark diving for sure but I'm really looking forward to seeing my friends. I live for my time with my friends. And I'm going to spend 2 days in L.A. with Paige so that will be awesome also!! 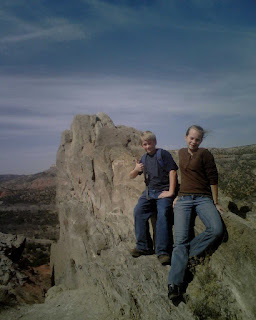 I'm looking forward to traveling again with them to Colorado and Palo Duro Canyon. I hope they behave themselves! They are really good kids, but sometimes long drives make them a bit crazy - or sugar... which I tend to avoid giving them! They're kids and well sometimes they like to whack each other...which either makes me laugh or furious, depending on my mood! I am going to bed "early" tonight. It's midnight. Last time I said that on this blog I actually ended up in bed at 2am. So much for early. However tomorrow I have a 9:30am coffee date with a friend who is in town, so I have to be somewhat presentable. Normally when I get up at 7am to take the kids to school I wear my pajamas, and am all disheveled which doesn't matter because I just climb back in bed as soon as I get home. I am NOT a morning person. Repeat: I hate mornings! bleh! However I can stay up 'til 4am without any trouble like I did last night. On another note, every morning I read this devotion "Jesus: 90 Days with the One and Only" by Beth Moore (who is awesome by the way) and today the lesson was on the parable of the ten lepers who Jesus healed together, but only 1 came back and thanked Jesus. It's all about gratitude, peeps. That is a beautiful passage. The lesson today speaks about being changed from the inside out. How the presence of the Holy Spirit of God changes a person physically and spiritually to the point where others can tell a difference. I know without a doubt I have been. And I hope to continue to be changed from the inside out, being transformed daily to be more and more like Jesus. Because He is radically awesome! And I am still sometimes pretty pitiful and whiny and insecure and bitchy and all kinds of unpretty things. But my general lifestyle has changed from darkness to light in so many ways. Related to this though is another lesson a few weeks back that really spoke to me. It was on the woman who poured perfume on Jesus' feet and how the Pharisee, the teacher of religion, thought "if Jesus only knew what kind of woman this was" he would never let her pour perfume on his feet. Course Jesus read his mind and said, "Simon I have somewhat to say unto thee" which sounds kinda funny because that is the King James Version but I think it's funny and cool. Mista I got somewhat to say to you! And what Jesus had to say was, lookee here mister, and then he told a parable about two men with cancelled debts. Who was more grateful? It was the one who had the larger debt cancelled. The woman who had sinned more and lived a more depraved life was truly grateful and loved Jesus (and hence God) deeply, whereas the righteous religious teacher had externally lived properly but inside his heart was cold and judgmental. Beth says something that I have long believed to be true, "I am learning that my heart and mind are of greater importance to Him than my words and deeds." Two people can do the same behaviors, but the heart can be in totally different places. And those who have lived lives of "depravity" and who have turned their lives around, transformed from the inside out by God's love - even if they don't recognize it as such - can end up so eternally grateful. (but maybe only 1 in 10?) Sometimes the transformation is not yet complete and others are out there still pointing fingers and judging. I also have some friends, or family of friends, who are still on the path of pain and sin and hurting themselves and others, which is so destructive and painful to watch. And I sometimes see judgmental self-righteous people, who are also killing themselves from within (I think Jesus calls them full of dead bones!). The path is narrow that leads to life! But it's not the path of self-righteousness or perfection or sinlessness, but the path of love, grace, and truth. Amen! I love that my kids are smart alecs, though I can't tell them that. I will put away what I get out. (at least she decided that last one was worth keeping). Well the tornadoes are comin through, so I better shut down the computer... it's spring in Texas! This is absolutely incredible. This is the research I'll be reporting on April 5-14 for Discovery Channel Online's Shark Week blog. The researchers catch the sharks using "shark rodeo," they use a rope to catch it by its tail fins and then bring it back to the boat. There are two species they're working with - reef sharks and tiger sharks. They're not on Youtube but will open a streaming video (WMV) on your computer. Here is the video of the whitetip reef shark rodeo (this is good because the guy is narrating). Here is the video of the tiger shark research (no sound). The boat is the one I'll be on - the Undersea Explorer. More later - I'm swamped! 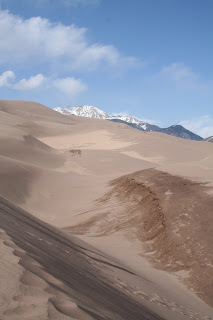 Yesterday I booked three flights to Colorado Springs, CO for spring break f or myself and the kiddos. I figured if I'm going to disappear to Australia for a few weeks I should bring the kids somewhere cool (darn that mommy guilt). Sam told me last year that every time he wishes on his birthday candles or a star or whatnot, he always wished it would snow. Fat chance of that happening in Texas, so I told him within the year I'd get him to see snow since neither he nor Savie have seen it - except in Alaska when they were too young to remember. And except for the snowpack outside of Yosemite National Park last summer, where they did get to make the coolest snowperson ever, and sled down on their behinds, and have a snowball fight (I have pics on my blog of that back in June 07!). At that time, I told them that I did my job, they got to see snow, but Sam said "Nuh uh! No fair!" Are they never satisfied?! While in Colorado, I will also interview some people for my book Losing My Religion: A Christian Struggles to Reconcile Evolution and Faith. One was involved in the Epperson vs. Arkansas 1968 court case and another is a theologian with the Presbyterian Church which is one mainstream denomination that accepts evolution, as is Episcopal/Anglican, Evangelical Lutheran Church in America, and others. Next summer I plan to get to Seattle to interview some people from the Discovery Institute who promote intelligent design. Which I don't agree with at all. But the book is about discovering all the things Christians believe about science and particularly creation and what it means for your average everyday person trying to figure out their faith - or whether what their kids are being taught in school is fact or heresy? 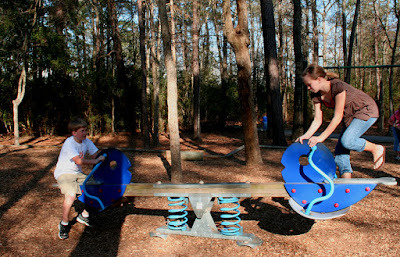 50 Ways to Get Kids Hooked on the Outdoors. co-authored by yours truly, Bernadette Noll and Dyanne Fry Cortez. 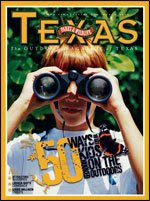 Texas Parks & Wildlife Magazine, March 2008. I also remembered that I have a 3rd piece in this month's OnEarth magazine, another short blurb on naming a butterfly by auction: Meet Joe Butterfly. I got my NAUI Scuba Diver certification card replacement this weekend. I absolutely love the ocean and have spent a lot of time snorkeling but haven't been diving since my certification dive in 1992!! We snorkeled daily in the Galapagos Islands last year and it was my favorite part of the trip. It was breathtaking and peaceful and amazing. I snorkeled in Australia a few times with the kids when we went in 2006, even though it was their winter and the water was chilly! It was my first visit to the Great Barrier Reef in Fall 1991 that created in me the desire to get Scuba certified, which I did as soon as I returned back home and started back the next semester in college in 1992. I spent hours diving in the Olympic sized pool at Texas A&M University, but alas besides my certification dive in Lake Travis in Austin - which had such murky water you could not see your hand in front of your face - that is the extent of my diving experience... I started an advanced Scuba dive class at A&M but I dropped the class. So that doesn't count. One time in Florida about 8 years ago, I thought I might dive in the crystal clear Homosassa River with manatees and go down into a cave. But I got my equipment on and the regulator mouthpiece wasn't fitting right and the mask was leaking and I was like, ain't no way I'm going down into that cave unless I feel comfortable... and I didn't, so I popped back up. I'm going to do a recertification program in Australia when I first get there then go on a dive in the Great Barrier Reef before getting on board the shark research vessel, headed out to Osprey Reef. I hope to get a lot of diving in! Funny thing, I got some Scuba books from the library and on one of the book covers it has three divers underwater with the "thought bubbles" above their heads and one of them is thinking, "Will I get eaten by a shark?" ha ha! Last night I watched a documentary on sharks with Sam. They are just such graceful and majestic animals. I'm looking forward to seeing them for real, in the wild, up close and personal. And I'm glad it's not great whites I'm going to be swimming with - MAN - they have some JAWS!!!! Not to mention TEETH!! Anyone out there watch the Planet Earth "Shallow Seas" episode with the ultra-slo-mo clip of great whites catching Cape fur seals? Wow that was cool. I wrote the online profile of Great Whites for Planet Earth's website. There are 10 animals profiled there - click on the shark thumbnail image. One alarming stat: Sharks only kill 4-8 people per year, but people kill 26-73 MILLION sharks annually!!!! Depressing actually. I heard this song just now and for some reason it brought tears to my eyes. It's from the song Head over Heels by Switchfoot, a Christian rock band. And I got to thinking about belonging, and how much I seek it. How much we all seek it really, and how much even falling in love is just what we believe to be total acceptance and love of who we are (and why falling out of love can be so distressing). People get involved in crazy things like cults and gangs because of a sense of belonging. And people stay in a church when they feel they belong and are greeted warmly. Our pastor once said that after a few weeks, people typically either stay at or leave a new church based on whether they have met a small group of people they connect with. I have struggled with belonging all my life. My mom was separated from my dad when she got pregnant. I was not planned or wanted. Mom always told me she "wanted a boy and a girl" and now she had that, but I have to believe that finding out about my pending birth was not a time of joy but marked with incredible turmoil and strife of heart and mind. My parents got back together for a year or so, then divorced. My brother so far as I can tell, always resented the new baby sister - me. Dad has said he's competed with me since I was little. He never wanted me around as far as I remember. He told me I broke his toys. In the court hearing (I have the transcript) he told the Judge he hated me, didn't want to live with me, and hoped the Judge would separate us. This was the 1970s and they rarely separated siblings, or gave custody to the dad for that matter, but they did. So after dad won custody when I was 8 my brother and I grew up separated. To whom did I belong? In my childhood, I moved probably 10 or 12 times growing up, never living anywhere more than 3 years. I was incredibly shy when I was young, and it took a lot to meet new friends. And as soon as I did, within one year to three, I would be torn away from them again. Twice in my life, moving was sudden; one day I'm there and the next I was moving away. I learned to make friends relatively easily but always tried to guard my heart so that when I had to leave it wouldn't hurt too much. It never worked. Moving always ripped my heart out. I was never a "popular" kid in school. I was teased for one thing or another. And unlike a lot of kids in high school I never had a boyfriend. I dated a couple of boys and had one longer-term boyfriend but he was in the Navy but there was no real belonging like you find in a relationship or close friendship. I was always longing for, not belonging. I made friends but it wasn't until high school I finally made a "best friend." She probably saved my life by being there, because by then I'd started a pretty self-destructive path, and I know for a fact she protected me from some things. And today, I treasure my friends past and present above all things and as they can attest, those who I connected with and who showed me kindness, I keep in touch with them and I'd go to the ends of the earth for them. Belonging. Friendships are probably the only way I've ever felt true belonging. I love both of my parents deeply, in different ways, but I never felt I belonged with them. I know that some of the loss and the longing and the strife of my family history can be called "story" - as author Debbie Ford and some others call it. Two people can experience the same thing and one can find gratitude and t he other rejection and pain and we can shape the days of our life by these defining events instead of living beyond them. In my life story, with all its insanity and loss - of innocence of stability of family of life of love of self - belonging was the thing I wanted, needed, longed for. Don't we all want to connect with others who love deeply and care genuinely and forgive and are true and honest and think that we are awesome and amazing? We all want to be liked. We want to belong. There's only one thing I've found in my life that means belonging besides my friendships. That is Jesus Christ and the love of God. What that means to me, truly in the deepest part of my heart and soul, is that I am loved and accepted for who I am. I am absolutely perfect in His eyes even in my vast imperfection. I can have no friends, be in prison, be utterly alone or despised by humankind, and He would still love me. Despite all the sins or mistakes I've made throughout my life and even that I will make in the future - all the people I've hurt and all the foolish things I've said and done and all the pain I've caused others and myself, I am adored. I belong. I belong to Jesus Christ. Godiva's latest ride We know chocolate fires libidos, improves moods, and makes hearts healthy. Who knew it could fuel cars? OnEarth Spring 2008. Looking for a Few Good Men: When they come home from Iraq and Afghanistan, our veterans may find themselves out of a job as well as out of uniform. Time to call Green Collar Vets. OnEarth Magazine, Spring 2008. This article is about Fort Worth's "Green Hornet" Jyl Dehaven and her partner-in-crime Georgia Richey as they plot how to turn Fort Worth - and the rest of the world - green. Their latest plot involves training unemployed U.S. veterans in the new wave of "green collar" jobs.